Most days I use sprouted grain bread but on this day I was lucky enough to have oatmeal bread made by my mom. 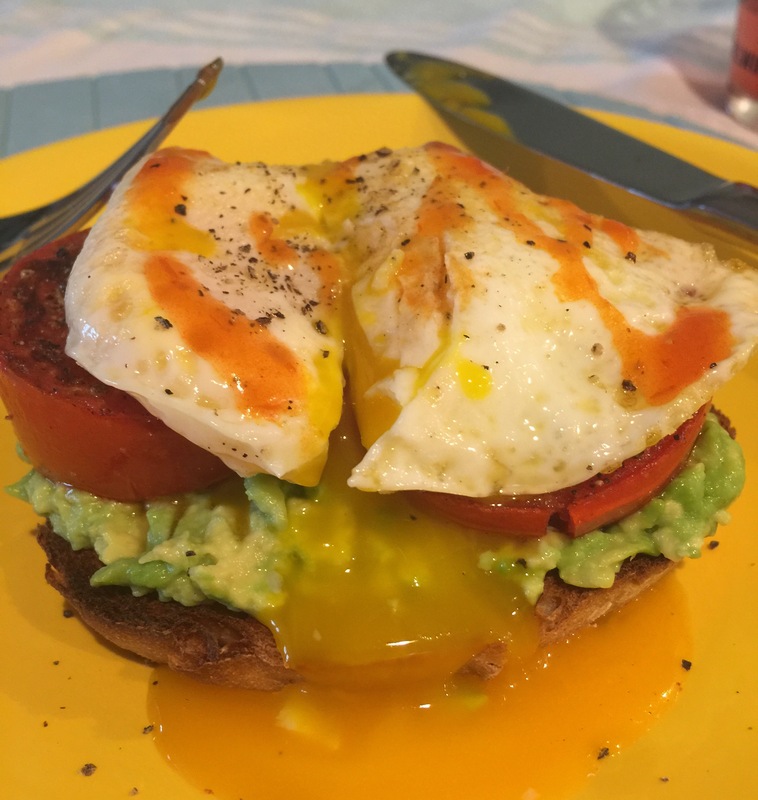 This is my go-to breakfast: sprouted grain bread, toasted, smeared with smashed avocado, runny egg, salty bacon and fried tomato. It’s quick, healthy, and filling. Every single time I cut into it and that yolk slowly oozes out, I’m forced to send a snapchat to all my closest friends. Because this is something that deserves their attention. I love to top this combo with good salt, pepper, and habanero sauce. I like to use course sea salt. My favorite salt is fluer de sel . 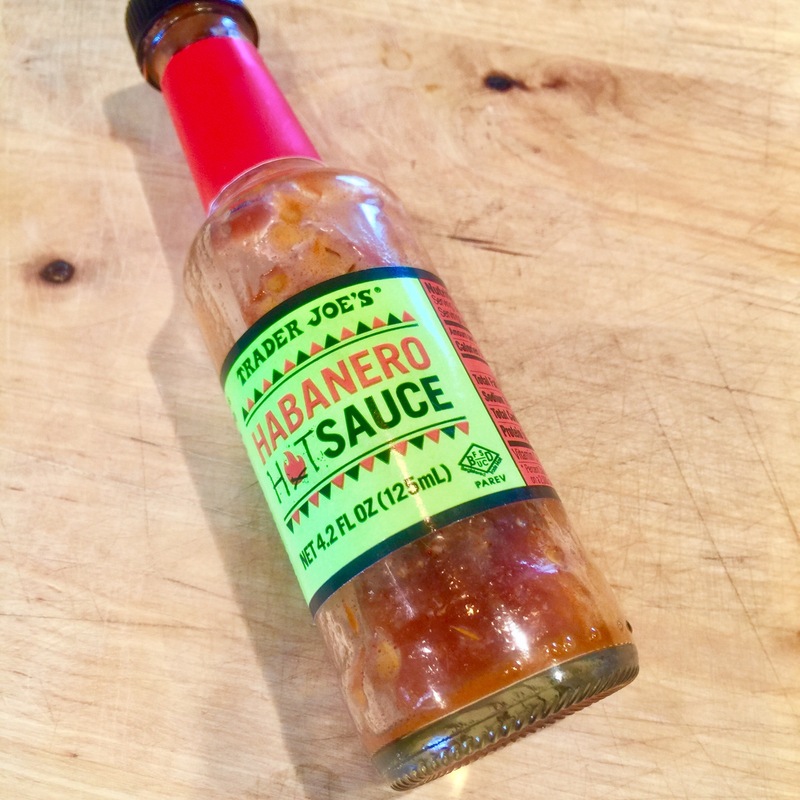 The hot sauce I like is Trader Joe’s habanero sauce. 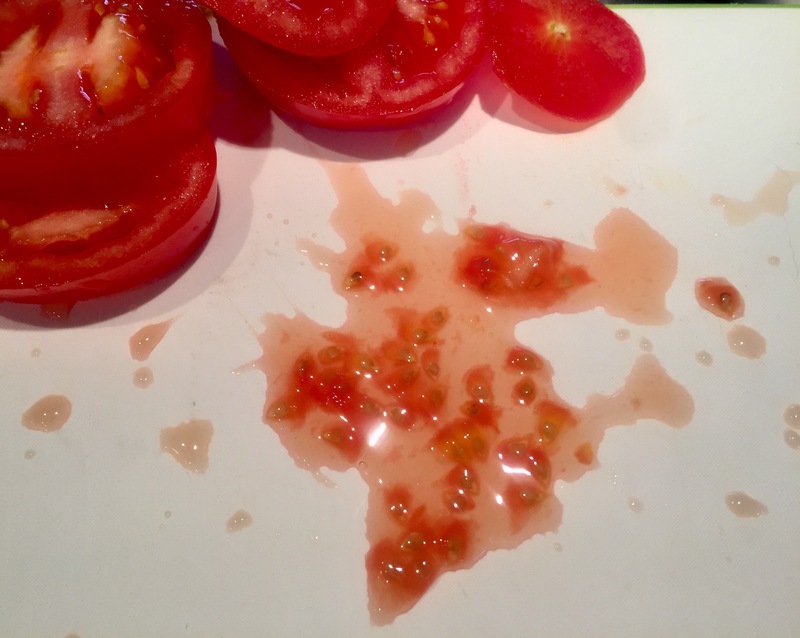 I heard on The Splendid Table podcast that most of a tomato’s flavor is in the seeds and membrain surrounding the seeds. You’ll use the juices to help break down and smash the avocado. Rinse your avocado and slice it in half. Scoop half the avocado onto the cutting board and sprinkle with salt. Let set. Turn your tomatoes over to fry on the other side. Now, you’ll crack your egg into the same pan while the tomatoes finish cooking. Sprinkle your egg with salt and pepper. Place your slice of bread in the toaster but don’t push it down yet! Smash your avocado up with a fork. Then, flip your egg and put your bread down to be toasted. Turn OFF the heat on the frying pan. You want your egg to be runny but not TOO runny. Slow runny. When the toast is toasted to your liking, put it on a plate, and spread on your smashed avocado. 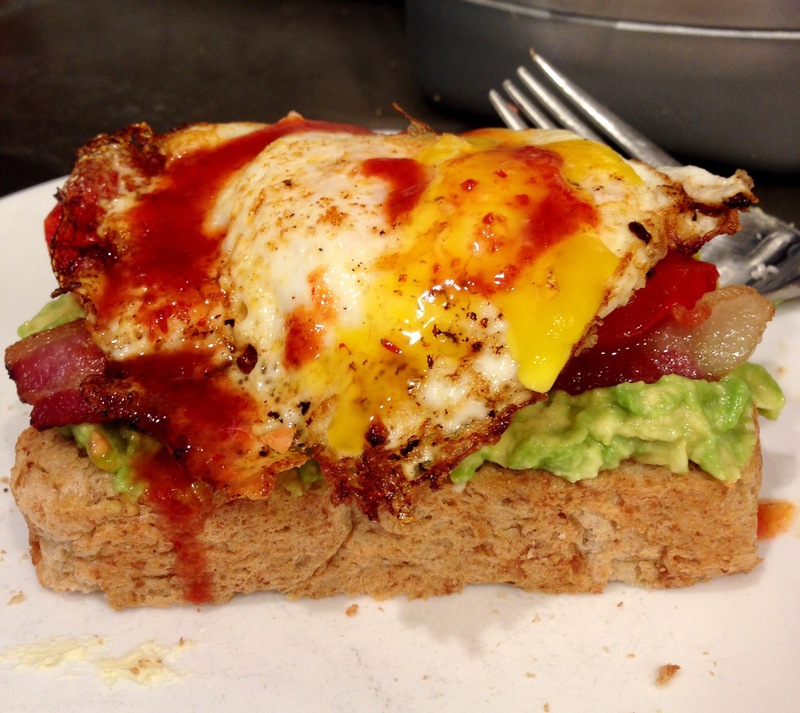 Top with the bacon (cut in half), the tomato slices, and finally that perfectly cooked egg. Pour just a little habanero sauce over the top. Cut into it, and take a picture. Enjoy! We have friends in town and we were all craving some spaghetti and meatballs so I made Barefoot’s recipe. So, so good. Watch the video in the link. Ina is so cool, so confident. Food can be a very passionate topic for some. This article sure grabbed my attention this morning: Why your Instagram photos of food may be racist . Check out the original article here. I really love culture sensitivity articles. This article on “American behavior” was quite enjoyable to me. After the Oscars last night (um…wow), we decided to watch the first episode of season 3, Chef’s Table. Amazing. Jeong Kwan is an absolute joy and inspiration! The part that stuck with me most was how calm it was at the monastery. Also, the vast amounts of bowls and barrels. This morning, we were discussing our Chef’s Table view and my friend brought up a good point. One always has to consider that with the attention that Chef’s Table brings, will it also bring tourists to the calm monastery? Alright. Ok! I do like chicken breasts sometimes. 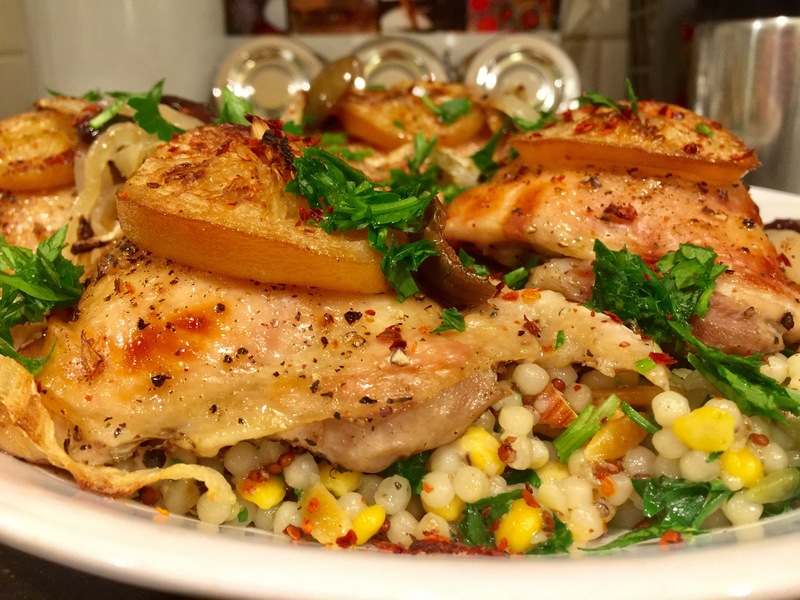 Blue Apron used to include the airline chicken breast cut. I loved that. Bring it back Blue Apron! I also love chicken breasts that are pounded until thin, breaded and fried. So there! It was about 8 years ago. We were invited to over to our new friend’s place for some drinks and snacks before we were going to go do….something. I forget what we did! Really, the only thing I remember about that night was the food and friends part. Especially the part when my friend brought out this gorgeous little cup of chowder with all these luxuriously fancy toppings. This chowder made quite the impression on me. I immediately asked her to send me the recipe the next day. It was quite involved, so I adapted it to be super easy for any night. Instead of peeling, dicing and then roasting a butternut squash, I use frozen. Yes! Instead of boiling corn on the cob and sheering it off the cob, I use frozen. Yes! There is no doubt that using the fresh ingredients would taste amazing. But have you ever tried peeling a butternut squash and then dicing it? It will probably make you angry. Choose happiness! One piece of equipment that makes this soup a breeze is my handy (ha) immersion blender. You can definitely transfer the hot vegetables and broth to a blender and it will be just fine, but what a pain. Go buy an here if you don’t have one. That is the one I own and love. Pour the oil into a large pot and heat to medium high. Add the sliced onion and season with salt and pepper. Fry the onion until fairly soft and then add the garlic, chipotle pepper with the sauce, and bay leaf. Fry about 30 more seconds and then add the frozen butternut squash and corn. Season with salt and pepper. Let that cook about 5-7 more minutes. Pour in the stock and turn the heat to medium low. Simmer everything for a good half hour. Meanwhile, heat a non stick or cast-iron skillet to medium high and add your bacon pieces. Fry until crisp. Take the bacon out with a slotted spoon, leaving the drippings behind. Add the sage leaves to the bacon fat and fry until crip but not burned. When the soup is done simmering for a half hour, get out your immersion blender and careful start to blend it up. If you don’t have an immersion blender, you’ll have to transfer the soup in batches to your regular blender and then transfer it back to the pot. 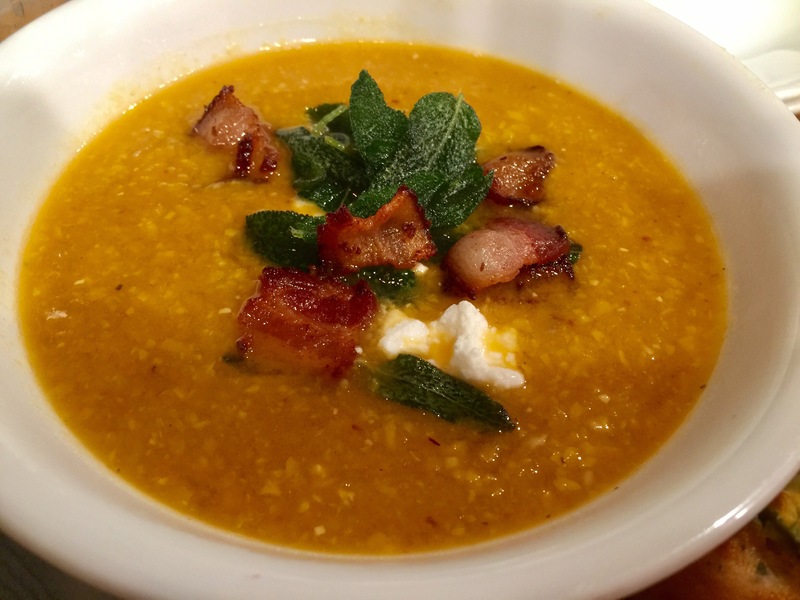 You’ll want the soup to be fairly smooth and blended. Taste it. Needs more salt? Probably. 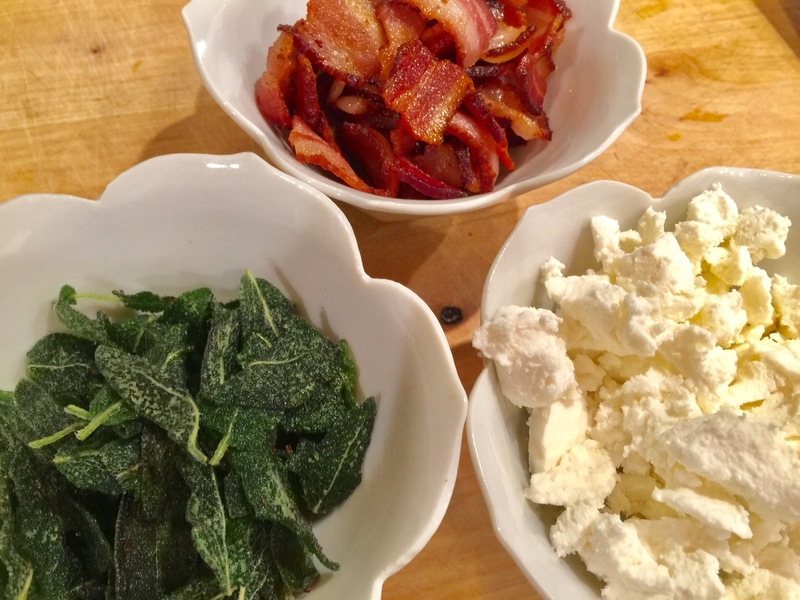 Try to keep in mind that you’ll be adding salty bacon, goat cheese and fried sage to your bowl. Dish the chowder into a bowl and top with the toppings. This would be delicious served with a simple green salad with olive oil and lemon juice and also some corn bread. Yes, the sweet kind! Pilpelchuma is the new harissa? Sriracha was the new Tobasco. Harissa is the new Sriracha. Pilpelchuma will be the new Harissa? I hope so. A few years ago, my sister gifted me a cookbook that changed my kitchen. For the first time, it took me to Jerusalem! Jerusalem is a cookbook by Ottolenghi and Tamimi. 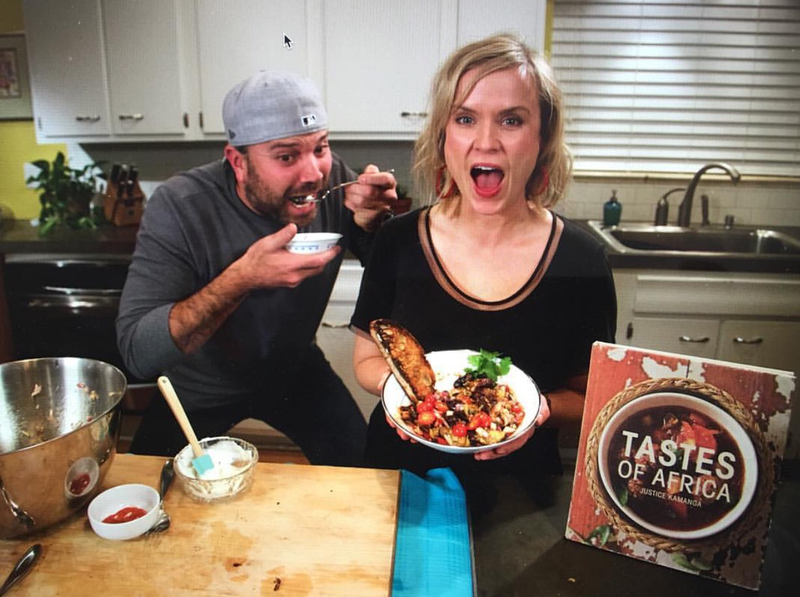 Amazing chefs who write amazing books. Towards the end of the cookbook is a section on condiments. There I found pilpelchuma. 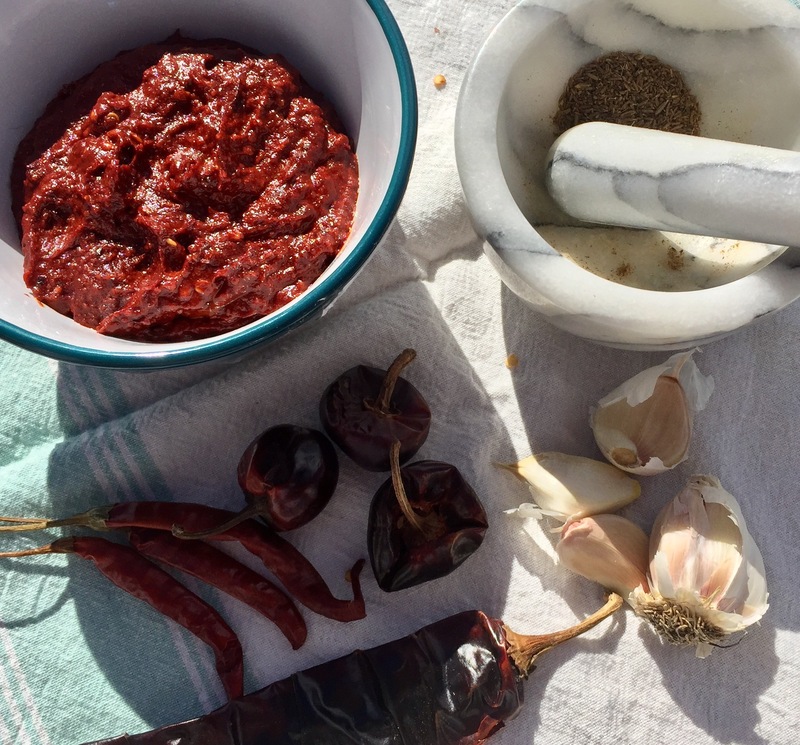 A chile paste made from dried then rehydrated medium hot chiles and powder. It also has SO much garlic, lots of paprika and cayenne pepper, caraway (which makes it really distinct), and cumin. You can find his recipe here. Or, better yet, buy Jerusalem! I actually set out to make this pilpelchuma the other day, but like usual, my cooking is often spontaneous causing me to improvise. Improvisation for me stems not usually from creativity, but often times from laziness. I don’t want to go to the store just to buy caraway seeds! What I made was a sort of riff on pilpechuma. And since I didn’t have caraway seeds, I’m not certain I can call it pilpelchuma. You’ll like this recipe. It tastes dangerous without consequences (except garlic breath). 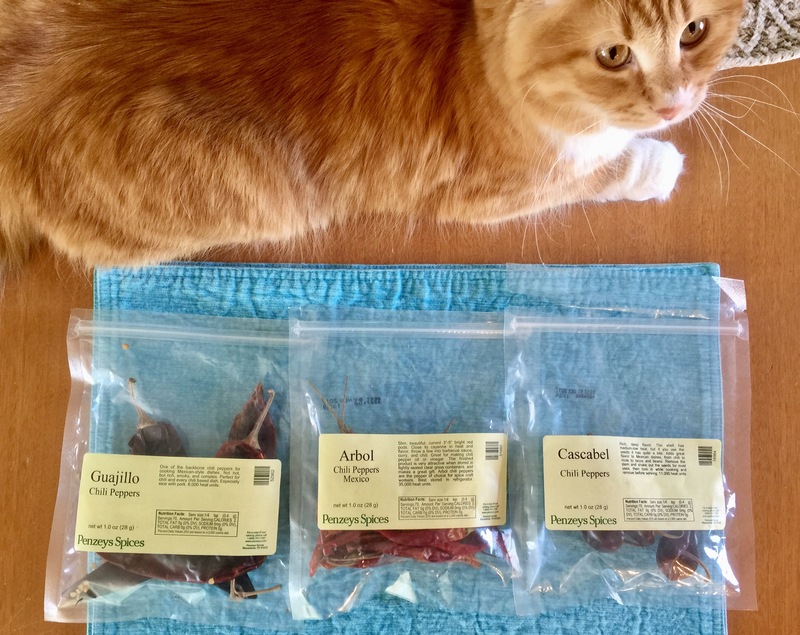 I bought my dried peppers from Penzy’s Spices. Soak the dried peppers in warm water for about 20-30 minutes. Meanwhile, break apart the garlic bulb and crack away the cloves from their skin. No need to chop them up. Use a pestle and mortar to semi-grind your cumin if using whole seeds. After the chiles have soaked, take them out of the water and reserve the water to use later. Don’t pour it out! It’s got that chile flavor now. Take the stems off the chiles and cut them into large pieces. Add the chiles, 1/2 teaspoon of salt, and all other ingredients (except the olive oil) to a food processor. Add just a few spoonfuls of the reserved chile water. Blend, blend, blend. Slowly, pulse in all of the olive oil. Scrape off the sides and blend a little more. You want it to be a thick paste but not too thick. Add a few more spoonfuls of the water and blend until desires consistency. Taste it. I told you it feels dangerous! Add more salt if needed. Use this chile paste the way you used Sriracha in 2008. I actually smeared it on a cheap breakfast burrito this morning. My next post will be on roasted chicken thighs and pilpelchuma is amazing smeared on those before and after roasting. Put your pilpelchuma in a sealed jar and it will keep for a few weeks. Pour a little olive oil to cover the top every once in a while and that will help preserve it. Umami. This is how you say it: ooo-mommy. Umami is that perfect flavor of salty and savory. But it’s more than that. No one talked about umami when I was growing up in Iowa. We didn’t know about it. All I knew was that when I discovered soy sauce I was in love. I doused it on every chance I could get. It’s the reason I stopped finally stopped crying when my mom would tell us stir-fry was for dinner. Soy sauce was definitely overused and abused by me. Umami is also that flavor of slow roasted tomatoes, roasted so long that every flavor is intensified until it tastes like a tomato in heaven. Umami is that flavor that is left in the pan after you sear meat, or make gravy, chicken piccata with lots of salt and lemon, and it has been sitting in the pan the entire length of dinner. Then, you act like you’re going to go do the dishes but instead quickly touch for a taste with your finger and hope no one saw you. THAT flavor. Gorgeous isn’t it? But now look how pretty this one is. 1 inch piece of fresh ginger (peeled and finely minced) You can also use 1/2 teaspoon ground ginger instead. Wash, dry, and prep your ingredients. Get a medium-large pot of water on the stove over high heat. peel and slice your watermelon radish into matchsticks. Put them all in separate little bowls and feel organized. When your water comes to a boil, add some salt and the rice noodles. Boil for the amount of time indicated on the package. While those are cooking, combine the sugar, soy sauce, peanut butter, chili oil, and rice vinegar in a bowl. Mix until combined. Drain the rice noodles, rinse with cold water to prevent sticking and to stop the cooking process. In the same pot used to cook the noodles, put a little high heat oil in the bottom. I like coconut or avocado oil. Heat it up but don’t let it start smoking. Add the white parts of the green onion, ginger and ground pepper, season with salt. Cook for only about 1 minute. Then add your sauce and simmer for about 5 minutes until slightly reduced. Reducing helps the umami factor. You want things to intesify! Add the rice noodles to the pot and toss, toss, toss to combine. After everything is thoroughly combined, and heated through, it’s time to serve it up. I like to serve it in a deep, wide bowl. Garnish your noodles with the watermelon radish, cilantro, peanuts, a wedge of lime, green parts on the green onion, thai chili pepper and or hot chili oil (if using), more ground pepper, and just a pinch of extra course sea salt. I love how spicy Asian style noodles are now widely excepted as comfort food all over. This turned out beautifully but next time I would slice my radish matchsticks even thinner. 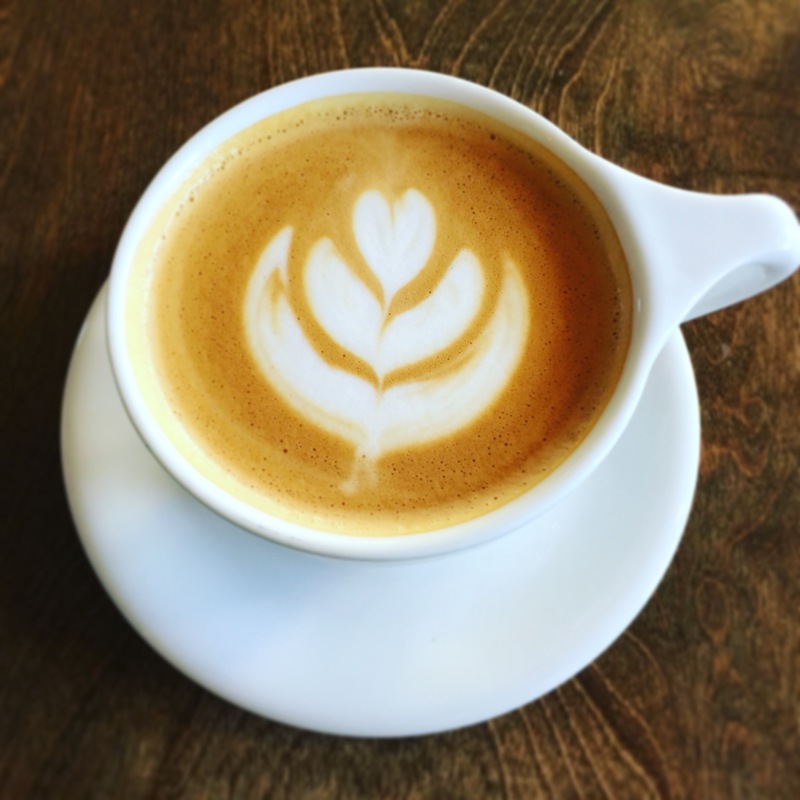 I hope that you started your day with a latte like the one above. Don’t you feel smarter and healthier? Thinking about the connection of African Food and American Food and reading this. Making injera is hard for me and I’ve been trying my darndest to figure out it out! I think of Injera as Ethiopian but I read here that it’s “Always present during mealtime, in countries like Ethiopia, Eritrea, Somalia, Yemen, Djibouti and Sudan with each country having it’s own variation.” Woah! This is good to know. So far, it’s been quite the failure to me. I’m obsessed with this this youtube channel and this one in particular is my favorite. The music, the camera angle and light. It’s like cooking ed plus asmr all in one. I just love them! Oh and how about this one. The perfect combination of Swahili, Pilau, and ASMR. I’ve been thinking about where I’d like to travel in my kitchen this week and what would be good enough to share with you. My friend introduced me to the most tasty Korean lettuce wraps with all the banchan. And don’t think I’m cool enough to know to just always remember that word. I’m always having to google “name of Korean side dishes”. Chips Mayai means “French Fry Eggs”. I first had Chips Mayai in Tanzania. Where I had it, they would fry french fries in a bunch of oil, then pour beaten eggs over to form an omelet. It would be served with Kachumbari (tomato, onion, cabbage slaw) on top with ketchup and pilipili (hot pepper sauce). Delicious! In this rendition, I’m shredding red potatoes up to use as hashbrowns instead of french fries. I’m also adding jalapeno pepper because I had one in the fridge that needed to be used. On top, again, in the face of not wanting to be wasteful, I’m being forced to add some shredded cheddar cheese and perfectly crisp bacon. If you don’t have any leftover cheese like me, try to make yourself feel better by saying “it’s more authentic”. That will convince anyone, including you. In the end, you had better have some avocado because that is authentically Tanzanian and it makes it feel a little healthy and tastes amazing. Remember when avocados were “too fattening”? What a sad time! You’ll also notice in this recipe that I’m going to instruct you to beat your egg mixture exactly 80 times. This is probably the most direct you’ll ever hear me be. I once heard on an episode of America’s Test Kitchen that 80 strokes were the precise amount to beat eggs for omelets. This, they say, is called science. And also, it was Christopher Kimball talking, plus a French woman, and with that combination, you know they know way more than you. Heat your cast iron or non-stick pan over medium-high heat. Place your 3 strips of bacon in the pan to fry. Meanwhile, shred the potatoes with a box grater or in your food processor with the large shred attachment. halve, de-seed, and thinly slice your jalapeno. Once the bacon is done to your liking (not too dark because of the carcinogens), set it to the side. Pour out most of your bacon grease and put it in your bacon grease jar to use later. With a little bacon grease left in the pan, spread out your shredded potatoes, onion, and jalapeno in the pan and make sure it’s on medium heat. Season with garlic powder, smoked paprika, salt and pepper. Cook the veggie mixture for about 6-7 minutes on one side. Take a spatula and peek that it’s browned before you flip it over the brown the other side. Let that side cook for about 5 minutes until browned. While the second side of the hash browns are cooking, crack your eggs into a medium sized bowl and add a little water or half and half if you have extra like I did. Why do I always have an excess of fatty dairy products? Beat your eggs for 80 strokes. 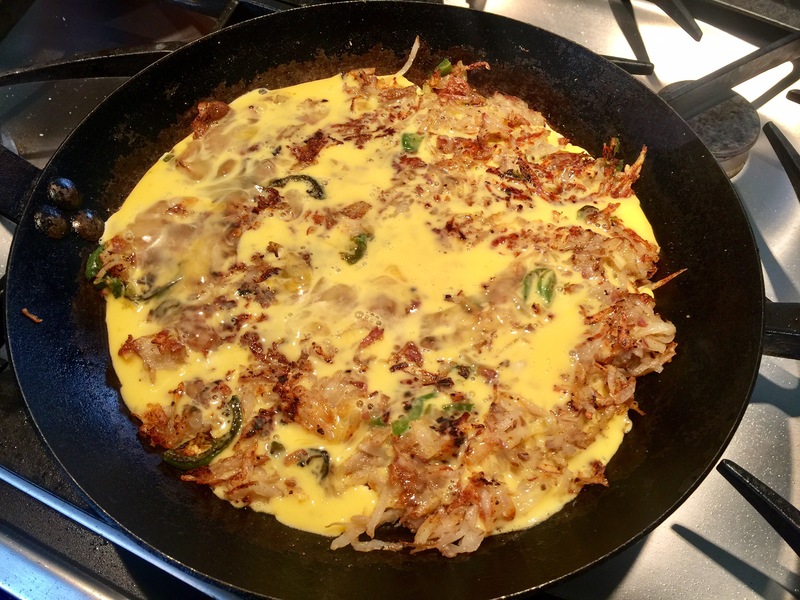 Pour your egg mixture over the browned hashbrown. Let the mixture cook for a couple of minutes, then grab a lid that fits your pan, turn the heat to low and cover the chips mayai until the egg has set but is still a little loose and shiny on top. This way you know that you haven’t overcooked your eggs. sprinkle your toppings on top. If you’re using cheese you may want to cover it again to melt it. Also, crumble up your bacon as you sprinkle it on. Cut the chips mayai into four pieces like a pizza pie. 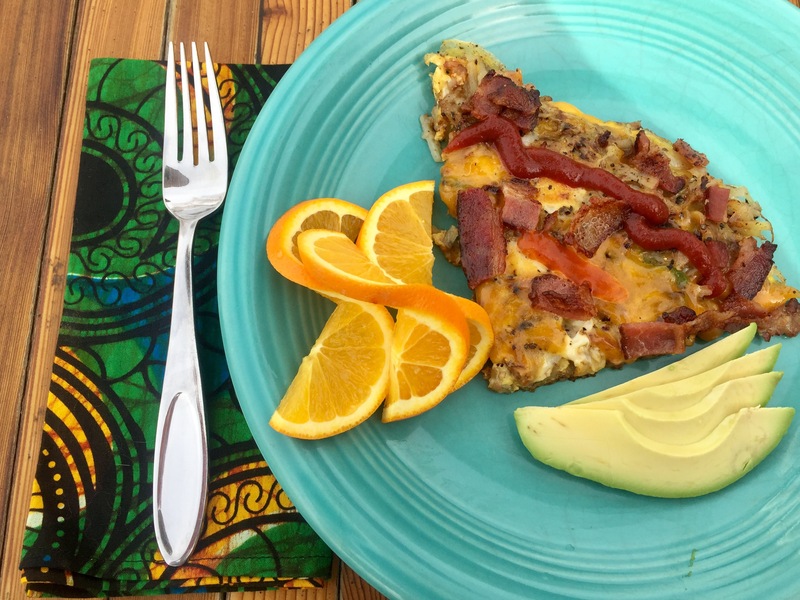 Serve with sliced avocado and fruit. It’s also best with a little ketchup and hot sauce on top. Serves 2 hungry people or 4 people with willpower. The best eggplant salad. Ever. It’s so good! I did my first ever cooking pilot last year and featured this recipe. This silly video shows what a natural I was in front of the camera. I swear I warmed up! And that is my kitchen and the bearded man is my husband. I bought my first African cookbook, Tastes of Africa, at our local bookstore, The Tattered Cover. I was so excited to go home and read it from cover to cover as any obsessed foodie would. Starting out, I made some of the more traditional stews and they were delicious and wonderful. After tackling the somewhat familiar, I branched out to trying some of the salads. And there it was “Aubergine” salad. What was an aubergine? I had a feeling it was eggplant (it is). Growing up in Iowa in the 80’s and 90’s, we never had eggplant. My mom cooked with plenty of vegetables and my grandmother had a large garden, but somehow, no eggplant. As an adult cook, I would dabble a bit with eggplant but it always seemed like a flavorless sponge. Well, it’s kind of true! It is a bit flavorless and it is a sponge. But! there was a secret I learned from the cookbook’s author, Justice Kamanga. You have to dehydrate the eggplant with salt and soak up all the bitter juice and then RE-hydrate the eggplant with olive oil. I later acted really cool about this technique, bragging about it wherever I went. It turns out, many “in the know” cooks already knew about this technique. I was just behind on my eggplant game. Okay, let’s get to it! If you’re like me you often scroll through all these words to get to the RECIPE! One more thing. Tastes of Africa, by Justice Kamanga remain my favorite multi-country African cookbook. It really started my enthusiasm for the cuisine that remains today. Slice the eggplant into about 1/2 inch rounds. Sprinkle each slice with sea salt and then leave to stand for 30-60 min. Take a clean dish cloth and press onto each of the eggplant slices getting up all the brown liquid. Transfer them to a roasting pan and drizzle with a little olive oil then toss. Let the olive oil really be absorbed by the spongy eggplant. Ensure that they’re lying in a single layer then place them in the 400 degree oven until soft, but still firm. You want them to be golden brown, still soft, not crispy! After they are cool enough to handle, slice the eggplant into bite-sized pieces. Transfer the eggplant pieces to a bowl and add the tomatoes, onion, and capers. Mix all the dressing ingredients together and pour over the eggplant salad. Toss gently. Serve on thick slices of toasted ciabatta bread topped with 1 Tbsp. of yogurt each. Sprinkle with the cayenne pepper and serve immediately. Serves 4-6. The director, Chris, getting way too excited about eating eggplant salad. Although, it really is that good!